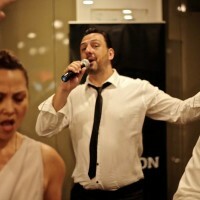 Jazz Notes with Rick Correnza played a corporate end-of-year function at Sarti in Melbourne. Some gentle music over lunch and building to the big sound. Especially when it came to the dance competition – in which so many people participated so enthusiastically! A great afternoon for everyone.